Two recent news stories each defy common sense to the tune of a minimum of HKD10 million (or US$1.3 million). In one story, wealthy parents of a teenage girl allowed her to collect 1,000 Louis Vuitton handbags and then bought a flat especially for the handbags. Each LV handbag cost a minimum of HKD6,000 and a typical small flat costs HKD6 million, which makes a minimum of HKD12 million spent. In another story, a scheming blackmailing mistress managed to squeeze HKD10 million from a Hong Kong businessman, and was holding out for an additional HKD129 million with the threat of killing his wife, daughter and business partner. And to contrast this, there is a poignant letter about poverty in Hong Kong, where we are reminded that there are one million Hongkies who live under the poverty line. The Oxfam World Wealth Report 2011 findings on poverty in Hong Kong came as a shock to most people and served as a wake-up call for the city's government. The report said that there are 144,400 poor families with children aged 15 and below in Hong Kong, and one in six such families frequently goes hungry due to lack of money. Statistics show that in 2009, there were one million people living under the poverty line, of which 340,000 were children. These sagas sound like tall stories for an affluent society like Hong Kong. Our government is spending billions of dollars on infrastructure projects and dishing out HK$3.7 billion to all permanent residents whether they need it or not. How much do poor people with a voice count on the economic scales of the administration? The Oxfam findings are totally unacceptable in a city that ranks fifth among well-to-do economies in the world. Your editorial ("Knee-jerk fixes no solution to poverty", August 19) hit the nail on the head. The Commission on Poverty set up in 2005 emphasised more employment opportunities for youth before it folded in 2007. The social enterprises schemes passed on to the Labour and Welfare Bureau have not eased poverty effectively. Similarly, the Community Care Fund launched last year and into which HK$730 million was injected for 2011-12, has 10 major items on its agenda. But they only cover areas outside the existing social security network, that is, the Comprehensive Social Security Assistance scheme that caters to people's basic needs. Since the Oxfam study showed that the poor families have only half the median income of HK$9,500, the CSSA should be thoroughly reviewed to see where it has gone wrong. Vice-Premier Li Keqiang urged the city's government to seek "practical and active" solutions to improve people's livelihood. One such effort is the Guangdong authorities' war on poverty, featuring the dispatch of 11,000 officials to villages in poor areas for up to three years to drive poverty out of the province. Another suggestion is to expand the food banks currently run by five non-governmental organisations under the sponsorship of the Social Welfare Department. Poverty is not a crime. 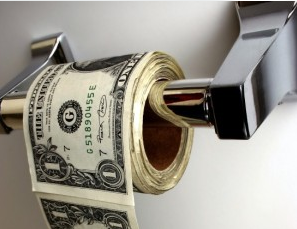 But for an affluent society to leave poverty unresolved is to breed social unrest. It is incumbent upon the city's government to seriously tackle the poverty that has sounded a death toll for our caring society. The wealthy parents of a teenage girl allowed her to collect 1,000 Louis Vuitton handbags and then bought a flat to store them - before they discovered she was suffering from autism. Most sufferers are diagnosed when they are just two or three years old, but the girl with the LV obsession made it to 17 - after a five-year shopping spree - before her secret came to light. She was addicted to high-end LV handbags, which cost from HK$6,000 to HK$15,000, because of their famous logo and patterns. She also got her parents to buy her a flat for them. The parents with more money than sense eventually took her to see a psychiatrist after she lost her temper and broke a glass, injuring her mother who was trying to tidy up her LV products. The LV tale was revealed by psychiatrist Miao Yin-king of Mind Pro Psychological Centre as she warned that addiction to shopping may be a symptom of autism. Autism is a disorder that affects the brain's healthy development of social and communication skills. Miao said around 30 percent of autistic children show normal intelligence, making it harder to detect. "Many parents just think their children have worse tempers than others and do not seek help," Miao said. "Nobody wants to label their own children. "Autistic children usually get outstanding academic results, especially in mathematics and science. So why would parents think their children are autistic when they are so intelligent?" The handbag girl is now 20 and fully recovered, Miao added. It was a lesson of life, she pointed out: buying branded products or even obsessively collecting car magazines may not be just a shopping problem but a sign of autism. Autistic people, she added, can be obsessed by items like pens or even graphical patterns like triangles and squares, which make them want to collect and possess them. Psychiatrists seldom use medicine with behavior treatment for autism patients but, according to a clinical study in Britain, symptoms are reduced in more then 60 percent of patients receiving treatment and the antipsychotic drug aripiprazole. Aripiprazole was originally used to treat people with early psychosis to control their behavior. Then it was found useful for autistic patients, with only minimal side effects. The 17-year-old LV girl took the drug for a couple of weeks before she received behavior treatment, during which her relatives gradually took away half of her LV products. She was finally able to accept an environment without being surrounded by LV products and went on to find another pastime - swimming. The antipsychotic drug, which is on the list of the Hospital Authority formulary, costs about HK$30 a day, but the quantity is varied according to a patient's condition. A consultation fee at a public hospital is HK$55, while HK$800 is charged for a 50-minute session at a private hospital, according to the Hong Kong Psychological Counselling Center. Six in 1,000 people in Hong Kong have serious autistic symptoms, while two in 1,000 are diagnosed with autism. A wealthy businessman was milked of millions of dollars by a bar hostess who threatened to kill his family when he tried to pull out of their affair, a judge heard yesterday. The woman allegedly threatened to kill the businessman, his family members and business partner when he wanted to end their relationship after five years. Ki Chun-yim, 37, pleaded not guilty to nine counts of blackmail between December 2007 and October 2, 2009, and one count of perverting the course of justice between March 27 and April 5, 2009. Ki - petite, with a pointed nose and thin lips - occasionally turned her head to peek at her ex-lover during the hearing. She is accused of attempting to extort HK$120 million from the businessman. The identity of 50-year-old "Mr X" is protected by a court order. He testified in a low voice from behind a screen, describing his months of ordeal. X said he met Ki at a bar where she worked in "public relations" in 2006 and she soon became his mistress. He put her up in a rented flat in Sham Shui Po and paid her HK$60,000 to HK$80,000 a month. Their relationship turned sour in August 2007 and he wanted to break up as she often asked for money. Ki demanded HK$800,000 to HK$1 million as a "break-up fee," X said. "She used hints or expressive words indicating threats to my family." X said Ki hated his wife - named as Y - and said she tried to encourage him to leave her. "Tell Y to have fun with her son while he is alive," Ki was quoted by X as saying. She increased her demand to HK$2 million and X gave her another HK$1 million, making HK$10 million in total. In early 2008, Ki claimed she was pregnant and demanded money to live in Canada, X said. "Even if she was carrying my baby, it would not change our relationship. It was over," he added. X said Ki hired private detectives to track him. On one occasion she entered the building in which his family lives. In April 2009, at a restaurant, Ki demanded money. X quoted her as saying: "Your family of three will be destroyed and killed. You can prepare your own coffins. All those around you will die one by one before you. That's the biggest punishment for you." Ki became agitated and threw plates on the table, causing a minor cut on his hand. She then warned X to expect more bloodshed in his family. "I surrendered again," X told the court, saying he paid her HK$3 million. The prosecution said X gave Ki HK$5 million on October 14, 2009, with a note saying this was for "full and final settlement." However, a month later Ki caused a nuisance to Y which led to Ki's arrest. Ki told police she received HK$8 million but was promised HK$10 million. She did not mean to harm X and his family despite her threats. X only knew from a newspaper after Ki's arrest that she had a 15-year-old daughter. The trial continues before judge Kevin Browne in the District Court today. A bar manager demanded payments totalling HK$139 million from her wealthy former lover and threatened to kill his wife, daughter and business partner if he didn't give her the money, the District Court was told yesterday. Ki Chun-yim, 39, was with the man, identified only as Mr X to protect his identity, for about a year. He rented a flat for her in Sham Shui Po and paid her HK$60,000 a month, the court heard. But testifying from behind a screen yesterday, Mr X, now 50, said after they split up, Ki told him she had hired private detectives to watch him. This made him believe she would harm him, his family and his business partner, identified as Mr Y.
Mr X told the court: "She was able to specify what law firms or investment banks I had visited. "She was also able to tell of conversations between me and Mr Y when we were in a massage parlour. "She said to me something like, `You enjoy a happy family life while I am always alone and lonely. I will make sure your family will be destroyed.'" He added: "She asked me to buy coffins for my family members. "It was out of extreme fear about her threat that I gave in and made payments to her." 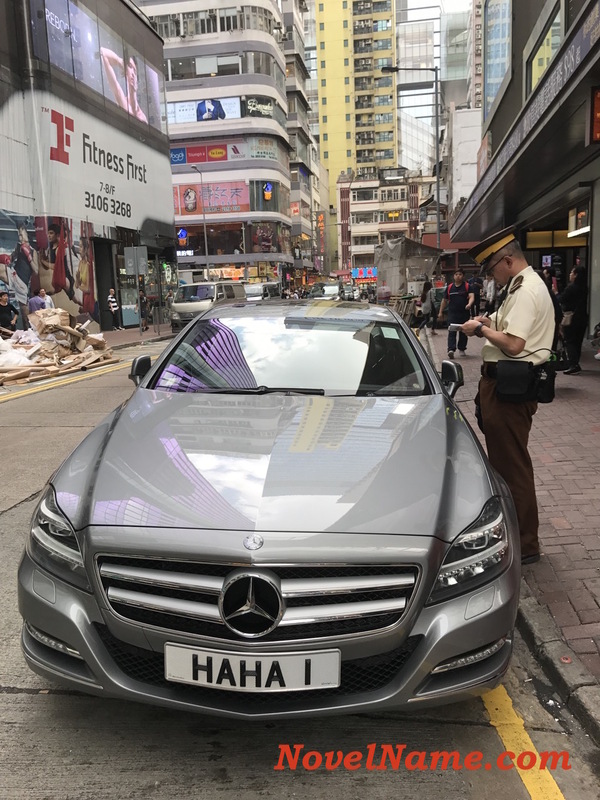 Senior Public Prosecutor Virginia Lau Siu-yee told the court that Mr X made several payments to Ki totalling up to HK$10 million, but she kept approaching him for more. Ki, represented by Lawrence Lok SC, pleaded not guilty to nine charges of blackmail, totalling HK$139 million, and one charge of perverting justice. The alleged offences took place between December 2007 and October 2009. Prosecutor Lau said Mr X came to know Ki in a pub where she worked as a public relations manager in September 2006. But the relationship turned sour and Mr X decided to part from her in August the following year. Mr X said they argued about money. He said: "When I told her I did not have in my bank account the amount she wanted, she said she wanted my company stocks." He added: "Once I stayed overnight in her place and there was a knife on the bed. She said she wanted to use it to kill me." In March 2009, Ki threatened to hurt Mr X's wife and daughter. She also told him it would be no use calling the police as she was "prepared to spend her life in jail". Ki made a report to police that month, but afterwards she threatened Mr X again, asking him not to give a witness statement to police, it was alleged. Ki was then arrested on December 10 last year. Lau alleged Ki made her first attempt at blackmail in December 2007 when Ki met Mr X outside her flat. She asked for HK$2 million or she would kill his wife and their daughter. She also threatened to kill Mr Y.
Mr X later paid HK$1 million in the hope of settling the matter. But Ki continued to go after Mr X, calling him and going to his office and his home, it was claimed. He later paid her further payments of HK$4 million. On several occasions between April and 0ctober 2009, Ki asked for HK$120 million. One afternoon in June 2009, Ki went to Mr X's office with a fruit knife and pointed it at him, Lau said. Ki was remanded in custody. The hearing will continue today. Being humble and honest should be the mantra of food critics, rather than pretending to be all-knowing and all-sensing and without a care for health. Whenever I hear or read about food reviews, the first thing that comes to mind is not the food being discussed, it is who the food critic is. Biting it [Sichuan catfish dish] released a most mind-blowing sensation in your mouth. It numbs your tongue for the first few seconds, then it turns tart ... and I don't even know how to begin explaining the rest of this culinary experience. Yes, if a food critic is unqualified or inexperienced in something or who recognises his or her limits, then the best policy is to be humble and honest. Contrast this to Yvonne Lai's search for ham dan jing yuk beng, a local Hong Kong traditional dish of steamed minced pork with salted egg. She and her companion(s) visited two local eateries, Man Sing Café and Happy Fish Bistro, both in Tai Hang. 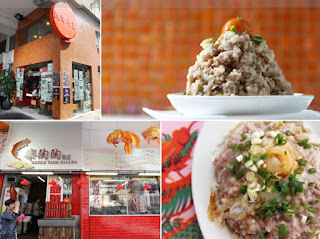 Two local eateries and their ham dan jing yuk beng dishes. 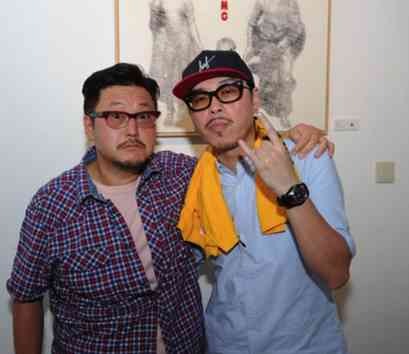 Pic from SCMP. We find ourselves staring at a tower of pale, glistening pork with a bright orange salted egg yolk twinkling like the star on a Christmas tree. Around this impressive structure was a moat of sweetened soy sauce with floating bits of freshly chopped spring onion. We carve out morsels of the soft, almost fluffy mass and take bites with mouthfuls of rice - and the meat just melts in the mouth. The combination of the pork's natural juices and the generous amount of fat and salt - there are some bits of gristle - make the use of soy sauce unnecessary for moisture. The salted egg is no competition for the mince itself in terms of richness. We speculate about the amount of fat, and briefly wonder what it's doing to our arteries, before polishing off the rest of it. It is whipped to achieve such an airy texture. This is definitely a minced pork dish that inspires gluttony. The steamed minced pork arrives in a wide oval dish - the meat's flat shape is more usual for the dish. The salted egg yolk sits in the centre, with the egg white cooked solidly around the edge of the pork cake. There are spring onion bits, but no soy sauce on this dish. As we take a spoon to the meat, we find that it is much firmer than the one at Man Sing. It's packed solidly, with an almost gummy texture from the cornstarch in the mix. Clearly, they believe in using less fat at Happy Fish Bistro. The result, although probably healthier, is a drier, harder cake. Here, the egg yolk is the star. Seeming somewhere between soft and hard-boiled in consistency, the yolk flavour had a rich intensity that Man Sing's did not, giving the mince some added character. Yvonne Lai's verdict: Happy Fish Bistro's steamed minced pork is just like mum makes. But Man Sing's other-worldly, fatty pork pyramid is the one we can't stop thinking about. My verdict: To help readers like myself gauge a more complete picture of food critics, perhaps a photo revealing the general appearance and healthiness of the people who are giving us their recommendations would be useful? In this post, I mention the chubby and cuddly food critic Leung Man-to. He is obese. Anyway, some people may equate an obese food critic to be somewhat good as a food critic; whereas others may equate an obese foodie to be biased more towards large portion sizes, high-calorific ingredients and a lack of self-discipline. But at least a picture can give readers an impression about whether a food critic should be taken seriously or not. BTW, Nanamoose does food reviews well. Her blog is a humble, honest and hearty collection of mostly great reviews. Anyone who was in contact with me last week, regardless of whether it was for a minute on Skype or for a few hours at the office, must have heard me mention my latest obsession - Sichuan food. Let me clarify something first: I was never crazy about spicy food. Spicy food for me was a bit like watching horror movies - you pay to torture your senses. While in Shanghai for a few days, I decided to become adventurous. Along with my friend, we checked Dianping (the Shanghai version of Openrice website in Hong Kong) and settled down in a Sichuan restaurant near People's Square for afternoon tea. We ended up ordering two of the province's signature dishes - Kou Shui Ji (literal translation: saliva chicken) and Shui Zhu Yu (water cooked fish). My friend and I started catching up while we waited for the food. Suddenly, her eyes widened and she whispered a horrified "Oh..."
I turned and towards us loomed a ginormous china bowl. After quickly recovering from my shock, I picked up a slice of catfish with my chopsticks and waited a few seconds for the excess chili oil to drip. The flavors were truly INSANE - like exposing your taste buds to some spicy fireworks. There was also a herb that very much resembled a hybrid between a peppercorn and caper. Biting it released a most mind- blowing sensation in your mouth. It numbs your tongue for the first few seconds, then it turns tart ... and I don't even know how to begin explaining the rest of this culinary experience. People often generalize about Sichuan food as being spicy. But this is a single, straightforward adjective which could be used to describe only a fraction of this amazing dish, as you would KFC wings, or your sauce of choice at Subway. But this was like an orchestra of flavors playing in your mouth - and it played some legendary score that our ancestors composed centuries ago. Student Gloria Yu lives life with passion and writes about it with hope. The neighbourhood of Tai Hang is the proud home of the 130-year old Fire Dragon Dance parade during the Mid-Autumn Festival. It retains a traditional Hong Kong village feel, despite the development of upscale flats up Tai Hang Road and the spillover of shiny, new shops from Causeway Bay and Tin Hau. Among Tai Hang's central blocks of low-rise residences, car repair workshops, restaurants, fruit stalls and newsstands, everybody seems to know each other. Nothing brings locals and newcomers together more than a home-style Cantonese meal, and Wun Sha Street is lined with tiny shops serving just that. On any given night of the week, neighbouring restaurants Man Sing Café and Happy Fish Bistro set up tables on the pavement and dish up local favourites such as the steamed minced pork with salted egg (ham dan jing yuk beng) we have chosen for this tasting. Man Sing doesn't have English signage or menus, but it does have a bright orange shopfront that you can't miss. The strictly first-come-first-served policy means no reservations and the whole dining party must be present to be seated. On a busy night, which was the case when we visited, that could mean eating surrounded by an audience of waiting diners just a metre away from your table. The waiting staff barely stop long enough to take our order of minced pork and rice before zooming into the small interior and zooming out with drinks. The dish follows within a minute, and we find ourselves staring at a tower of pale, glistening pork with a bright orange salted egg yolk twinkling like the star on a Christmas tree. Around this impressive structure was a moat of sweetened soy sauce with floating bits of freshly chopped spring onion. The next night we make our way to Happy Fish Bistro, which is famous for its steamed pomfret (no surprise) and roasted meats. But like any self-respecting home-style Cantonese restaurant, it has its own versions of steamed pork mince. We are tempted to order the one with preserved vegetables, but stick to the salted egg version for the sake of the review. While the tables inside the small dining room are full, the atmosphere here is more relaxed and service more leisurely at the only table outside. The verdict: Happy Fish Bistro's steamed minced pork is just like mum makes. But Man Sing's other-worldly, fatty pork pyramid is the one we can't stop thinking about. 1) There have been some bizarre home photos of Tony Chan published by Hong Kong newspapers over the years. The ones I have seen are cringeworthy. For example, this recently-published one where Chan's puny mate is holding him in his arms. The funny thing is that these kind of cringeworthy poses seem to be quite popular amongst Hongkies. From a Western perspective, this kind of "friendly" pose would really only consist of a macho guy holding his girl in his arms. And if it is two guys, then the guy being held and cradled is usually the smaller, weedy and probably less macho of the two. However, local Hongkie males tend to love doing this kind of thing to each other. This two-guy pose is really effeminate, cringeworthy and seemingly common amongst Hongkies. Does anyone else have any cringeworthy pics of Hongkies that they would like to share on this blog? Please? "As a husband and father, he only gets 60 marks. But he loves every member of the family." To many, 60% is a failing mark or at least a "below satisfactory" grade. So what drives certain women to apparently stand by their men even though they have been wronged or shamed (e.g. Is It A Hard Life?)? Money? Inequality in the relationship? Money? Low self-esteem? Money? Low education? Money? Fung shui practitioner Tony Chan Chun- chuen says he has received useful inside information after he offered a US$10 million (HK$78 million) reward for evidence to help him uncover the truth surrounding the late Nina Wang Kung Yu- sum's estate. The evidence includes what he claims to be a fingerprint sample of Wang, who he insists was his lover and not just a client. Chan told the Sing Tao Daily, sister newspaper of The Standard, that an advertisement offering the reward he placed in Chinese-language newspapers last month drew a "heated response" from members of the public. "My lawyer initially thought it wasn't a good idea [to place an ad], saying I would get spammed," he said. But Chan, who faces criminal charges over the will, said he received words of encouragement and also information he believes to be useful to his court case. Chan, who is out on bail, said he will discuss with lawyers the authenticity of the evidence before placing it before the judge. In the advertisement, Chan said the reward will be paid for solid information that helpsw him win the legal battle. Chan lost a high-profile court case for the estate of the late property tycoon after the will he presented was ruled to be a forgery. Instead, the courts found that a will held by the Chinachem Charitable Foundation, set up by Wang, was genuine. In May, Chan took his case directly to the Court of Final Appeal. gal fees, the self-styled fung shui master described himself as "a terminally ill patient" who has paid a huge price to prove his innocence. The interview was held in his 5,000-square-foot home at Gough Hill on The Peak, which is without luxury fittings and with cardboard boxes piled up in the living room. After he lost in the High Court and Court of Appeal, his aides - Regal Cyber Group chairman Raymond Chu Wai-man and deputy chairwoman Anita Chow Pak-kun - resigned for personal reasons. Chan dismissed reports his partnership with Chu broke up because he pursued a HK$50 million debt. When asked what will happen if he loses the appeal, he said: "I know I am innocent as I did not fake any documents. "If there is a miscarriage of justice, I will ask my wife to visit me in jail and try to live life with courage." His wife, Tam Miu-ching, vowed in the interview never to divorce Chan and promised to support her husband. "As a husband and father, he only gets 60 marks," she said. "But he loves every member of the family." 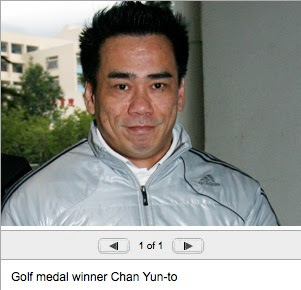 This rather beefy "golfer" is actually 2006 Asian Games bodybuilding champion Chan Yun-to, jailed in 2010 for bribing an official to shorten a ban from competition for failing a drug test, and freed this month after winning an appeal. These things just don't happen in Hong Kong. Apologies? Two? First , the Hong Kong Hospital Authority says sorry (to blood victim). Then, the University of Hong Kong's vice-chancellor says sorry too (on the treatment of protesters). Hmmm, if One Country Two Systems does not work, then is it reasonable to say two apologies probably won't work either!? The chief executive of the Hospital Authority has apologised to a woman who suffered a brain haemorrhage after receiving the wrong type of blood in a transfusion. A day after the incident at the Caritas Medical Centre in Sham Shui Po came to light, Dr Leung Pak-yin admitted there had been a serious mistake. "We are deeply sorry to the victim and her family," Leung said. The 64-year-old woman developed a brain haemorrhage after being given blood type A, instead of type B. She was being treated at Kwong Wah Hospital in Yau Ma Tei, where she was said to be in a serious condition last night. Initial investigations found that laboratory staff at Caritas had swapped the woman's blood test results with those of another patient. The other patient did not require a transfusion and had already been discharged from hospital. A panel of medical experts will investigate the incident and is expected to issue a report within eight weeks. 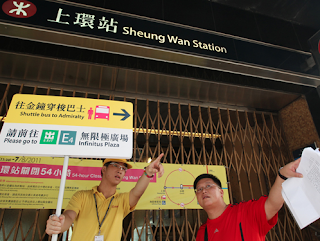 Dr Derrick Au Kit-sing, the authority's head of human resources, said yesterday that the blunder was a one-off. "As far as we know, the mistake this time occurred in the laboratory but not during the blood sampling, blood grouping and blood transfusion, so there was not a fault in the bar-code system," he said. Since 2008, public hospitals have used a bar-code system for labelling blood samples in an effort to prevent specimen mix-ups at hospitals. Under the system, staff who want to print a label for a blood sample must first scan a bar code on a patient's wristband, then another bar code on a document containing the patient's particulars. Only if both barcodes match will the label be printed. Noting that such incidents were extremely rare, a spokeswoman for the authority said that the only previous case on record occurred in September 2004. The University of Hong Kong vice-chancellor said sorry yesterday over the treatment of protesters at the campus during a visit by Vice-Premier Li Keqiang on Thursday when three were pulled to the ground by police and one was locked up for an hour. Professor Tsui Lap-chee's apology came as he faced a hastily arranged and noisy meeting with students amid calls for him to step down. "If the school board feels that I have committed any wrongdoing, I will step down to shoulder responsibility," Tsui (pictured) said. A row has also broken out over how Li was invited to the university. Some reports suggested the visit was initiated by Li, but last night the university issued a statement saying it had invited him. "Tsui Lap-chee clarifies that Vice-Premier Li Keqiang was invited by HKU. HKU is based in HK and keeps close contact with the mainland. Inviting [state] leaders to come can facilitate mutual understanding and communication." Chief Secretary Henry Tang Ying-yen, meanwhile, described as rubbish claims by journalists and politicians that freedom of expression was suppressed during Li's three-day trip to Hong Kong. On Thursday, students and alumni were hemmed in by police 200 metres from the university's 100th birthday celebration, which Li attended, with three being pulled to the ground and one dragged off and locked up for an hour. At yesterday's meeting, Tsui had an emotional exchange with the student who was locked up, Samuel Li Shing-hong. "You don't seem to care about your students. I demand your apology," Li said. Without waiting for an answer, he stormed out as Tsui immediately said: "I now offer my apology." Responding to student accusations that he acted like a coward, Tsui said: "I do not think I acted like a coward ... neither did I hear anyone say I am a coward." The Hong Kong Journalists Association accused the police of hampering media coverage and freedom of expression, saying journalists had to endure stringent checks on their baggage and were kept far away from the state leader during his visit. Tang rejected the criticism, saying: "I think that it is completely rubbish [to suggest] that we have violated the civil rights law or we have violated freedom of speech." He said the administration had a responsibility to ensure the visits by prominent politicians proceeded smoothly and safely and he had confidence in the professionalism of police. "We completely respect freedom of the press in reporting." But association vice-chairwoman Zoe Chan Suet-yee said journalists were restricted to places at least 50 to 100 metres away from Li. "When he attended functions held at the Convention and Exhibition Centre, even after security checks, journalists could only cover the events by sitting in a room watching a live feed on a television set." The association will march from the new government headquarters in Admiralty to police headquarters in Wan Chai today to protest against what it terms police abuse of power over media coverage. Last night the police responded to comments by Tsui in which he suggested the force was reviewing security arrangements as a result of the students' concerns. A spokesman said it was normal practice for a review to be carried out after public order events, adding that the force respected freedom of speech but had to balance that with the need to ensure the safety of the state leader. A special security panel meeting will be held in the Legislative Council next Friday to discuss the issue. Panel chairman James To Kun-sun said: "The arrangements by police over the past few days have touched on the core values of Hong Kong people. They acted like mainland police." Secretary for Security Ambrose Lee Siu-kwong defended the arrangements. "We respect press freedom but we also need to strike a balance between it and the security of a visiting VIP," he said. Excuse me, can you tell me where Buzz Lightyear is please? I don't follow beauty pageants but I do follow local bloggers ... not that I am implying that they are the same thing ... which they are not! 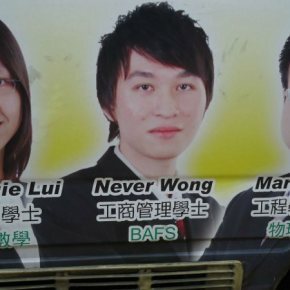 Anyways, the Miss Hong Kong 2011 title was brought to my attention by Spike at Hongkie Town (see post here) and just having a glimpse at some of the contestants made me wince at their relative states of "healthiness". In contrast, take a look at super-conditioned Kimiko Date-Krumm, a 40-year-old professional tennis player. 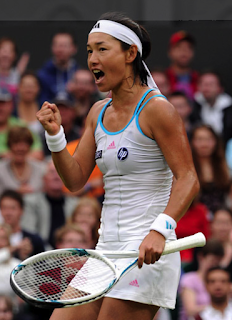 Aside: Kimiko Date-Krumm's tennis career is all the more remarkable considering the Asian obstacles that she faced. She is naturally left-handed but was forced to play right-handed (just as many left-handed Asians are forced to use chopsticks with their right hands). 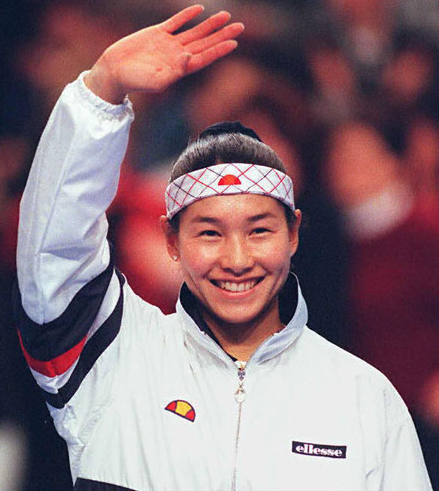 Even with that disadvantage, Kimiko was ranked World No 4 in 1995 before retiring in 1996, 4 days before her 26th birthday. Almost 12 years later, in April 2008, Kimiko made her comeback, which has been successful. Just imagine what Kimiko Date could have achieved in tennis had she not retired. We can only speculate and romanticize! Back to the plot: Swimsuits. Out of the 14 Miss Hong Kong contestants, why did 4 girls not wear matching bikinis? The Good News is that these poorly-conditioned girls are relatively young, and therefore have time on their side to buck up their ideas and lifestyles. Generally, if people are willing to listen to experienced mentors and qualified experts, then the goal of having a healthy, balanced lifestyle is really not that hard to achieve. One example of a local celebrity that springs to mind is veteran artiste Dodo Cheng (yes, another future HKSAR Name of the Day). She discovered exercise and fitness as well as eating healthily relatively late in her career and life, but since then she is reported to need her daily fix of exercise otherwise she suffers withdrawal symptoms. There are many examples of Kimikos and Dodos out there who can help inspire us to healthy lifestyles. Handbags for Carson's protection. Pic David Wong. 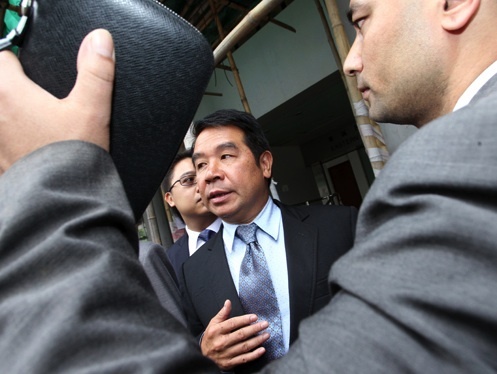 Carson Yeung, owner of Birmingham City FC, has been denied a visit to England because of the "risk of absconding" as pushed by prosecuting lawyers. It seems lawyers love playing games as much as businessmen and politicians. Why not leave the gamesmanship and play-acting to real sportsmen? Lol. Hong Kong tycoon Carson Yeung Ka-sing, the owner of English League Championship soccer club Birmingham City, was yesterday refused permission to travel to Britain to deal with club affairs. Yeung, facing charges of money laundering, asked a court to lift a bail condition imposed earlier that required him to surrender travel documents. Jonathan Kwan, counsel for Yeung, told Magistrate David Dufton in Eastern Court that Yeung wanted to deal with financial matters and player transfers. "Mr Yeung is extremely hands-on with his football club," he said. Kwan said on the intended four-day trip from tomorrow to Tuesday, Yeung wanted to meet new manager Chris Hughton, appointed after his arrest, to discuss the way forward. Yeung also wanted to discuss with the club board and management the player transfer window, due to close by the end of the month. "To show his face would make a lot of difference and would restore the confidence of fans," he said. Kwan said it would be difficult for Yeung to abscond as he had strong family ties in Hong Kong and was a well-known personality both in the city and in Britain. The lawyer offered an extra HK$1 million surety to add to Yeung's existing HK$7 million bail. But the prosecution objected, saying there was a risk of Yeung, who was charged with a serious offence, absconding, and that he could appoint someone else to manage the club. The magistrate dismissed the application, only allowing Yeung to continue bail under the existing conditions. The case will be transferred to the District Court on August 30. Birmingham City yesterday insisted it was business as usual following Yeung's bail extension and continued travel ban. "Carson is the president. Day-to-day, hands-on stuff is our responsibility. This situation does not hinder the running of the club at all," a Birmingham City spokesman said. Acting chairman Peter Pannu, a Hong Kong barrister, was running the club, the spokesman said. But Yeung's 18-year-old son, Ryan, named after Manchester United star Ryan Giggs, was not involved in club business despite being named as a director by his father after Yeung was charged with money laundering. Manager Hughton was sourcing players on loan, the spokesman said. Pannu said he had had to make unpopular decisions at the financially troubled club after Yeung's arrest. Andy Webb, who runs the fan club of the Small Heath Alliance - Birmingham's original name - said: "It would have been good for Carson to come over and show his face and assure fans. "There's a lot of concern and caution. We're just hoping the manager can muddle through until there's an end to all this uncertainty." So the HKSAR Government wants Hong Kong to be Asia's World City, but it continues to drag its feet in helping to condemn unscrupulous tourist traps. Yet again, we hear from the Consumer Council about the numerous tourists duped by the camera shop salesmen (see press release here). The Consumer Council does its job in raising awareness, but the sad reality is that without any supporting legislation and prosecution powers it is a toothless organisation. Somewhat unrelated: Who's Baiting Who? The Consumer Council has renewed its call to make unscrupulous sales practices a criminal offense as its name-and-shame drive has apparently failed to stem such incidents, which have risen 10 percent over the past year. The council received 272 complaints in the first seven months of the year relating to misleading sales tactics adopted by shops selling digital electronic products. 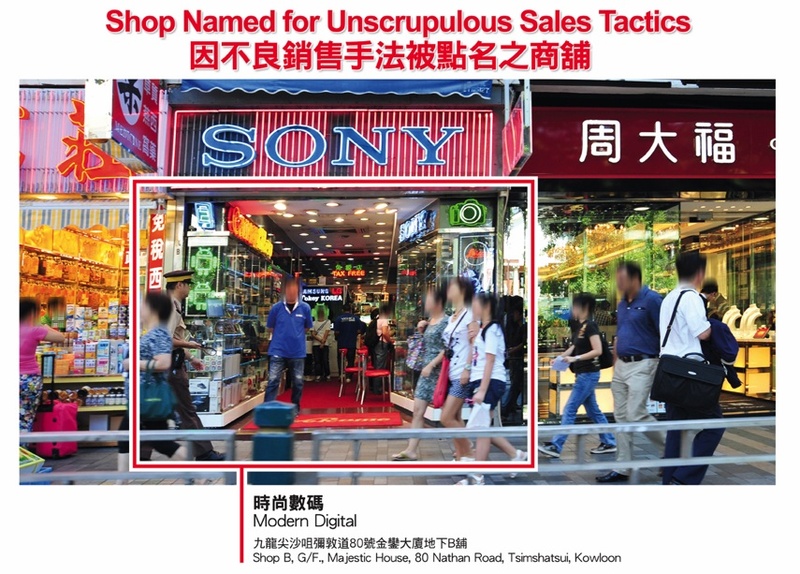 There were 143 complaints against two shops in Tsim Sha Tsui, from January last year until the present - Modern Digital and Sunshine City - which involved a sum of over HK$1.6 million. Council chief executive Connie Lau Yin-hing said the government should broaden the Trade Description Ordinance to allow unscrupulous sellers to be criminally charged. Modern Digital is alleged to have sold a Zhongshan couple a camera without proper documents and functions. The man, surnamed Luo, said he paid HK$6,500 for a Canon camera on Monday. On returning to his hotel he found there was neither an instruction manual nor a guarantee certificate. It also did not have a video-taking function which the salesman claimed. Luo went to another shop in Mong Kok yesterday to inquire about his camera and was told it may be a parallel import worth only HK$3,000. He later received a full refund after a salesman, surnamed Fung, put it down to a misunderstanding. 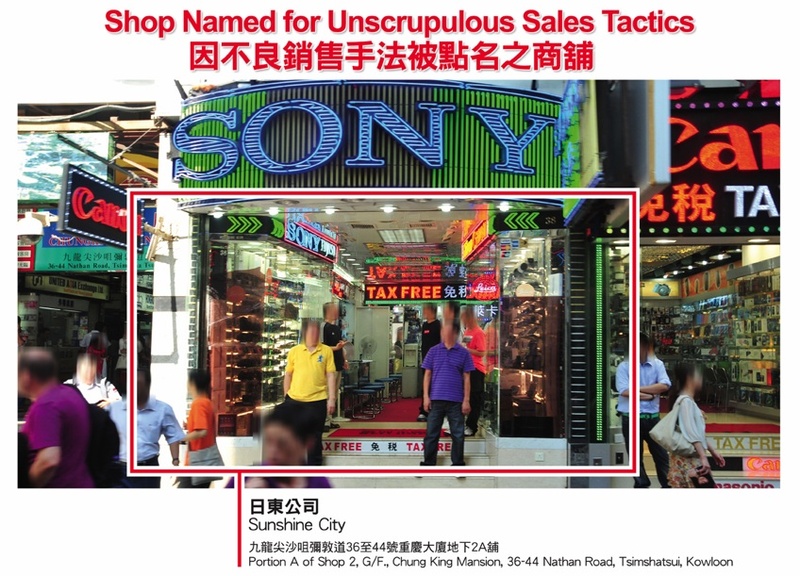 The Consumer Council wants the trade descriptions law changed quickly to outlaw unscrupulous sales practices such as the bait-and-switch tactic and other ruses it says two Tsim Sha Tsui camera shops use. 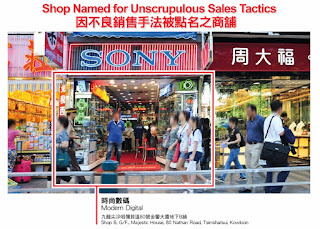 The council said yesterday that Modern Digital and Sunshine City, both on Nathan Road, were alleged to have cheated customers out of HK$1.6 million since the beginning of last year. It has received 95 complaints against Modern Digital and 48 against Sunshine City in that period. All were from tourists. It said the shops would press their customers to pay before checking their purchase and then would say the product they wanted was out of stock and talk them into buying a more expensive one. They would also sell second-hand products as new ones and older models as the latest ones. Council chief executive Connie Lau Yin-hing said the watchdog hoped the government would soon submit to Legco delayed legislation to amend the Trade Descriptions Ordinance. "Then these sales tactics will be criminalised and the consumers can be better protected," Lau said. The government had been expected to submit to the Legislative Council an amendment to regulate misleading claims and prepayment packages that fail to meet buyers' expectations before the legislative session ended last month, but did not. The council said both shops, like many others in the area, attracted tourists with huge neon signboards of camera brand names and did not show their shop names on the outside. The chairman of the council's trade practice committee, William Chan Che-kwong, said it had warned the shops repeatedly but had not seen a change in their sales tactics, so it decided to name and shame them. In one case, a South African tourist looking for a particular camera costing US$1,250 in Modern Digital was persuaded to buy a "newer and better" one for US$1,400. The camera had no packaging case or user manual. He was given a free camera bag and was told the receipt could be used as a worldwide warranty. He later found the camera was an older model and returned to the shop. The shop refused to change the camera because he did not have the packaging case or manual. Chan said these tactics had existed for decades and were becoming more widespread. As the council had no prosecutorial power, there was little it could do. 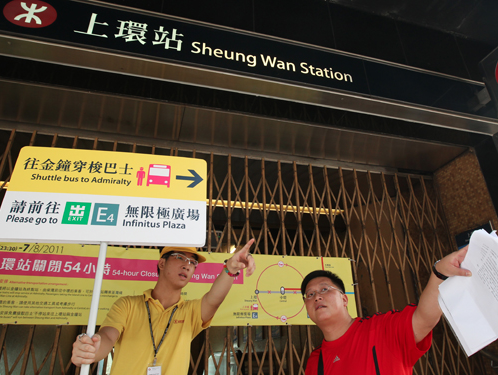 The council has alerted the Tourist Commission and Hong Kong Tourism Board about the two shops and will inform the China Consumers' Association and National Tourism Administration on the mainland. The Consumer Council received 602 complaints concerning audio-visual and digital electronic products in the first seven months of the year, compared with 537 in the same period last year. Complaints of unscrupulous sales tactics rose to 272 from 247.
see also Ulaca's Lily Chiang Set to Do a Runner? and Oh Sisters Two, What May You Do? Businesswoman Lily Chiang Lai-lei was yesterday found guilty of being the "mastermind" of a HK$3.7 million share manipulation scheme. The former Hong Kong General Chamber of Commerce chairwoman was convicted of fraud, conspiracy to defraud and authorizing the issue of a prospectus that included an untrue statement. Chiang, 50, from an influential pro- Beijing business family, was calm and stared at her husband and family as District Court judge Albert Wong Sung-hau finished handing down a verdict that took three days to go through. Judge Wong said all evidence pointed to the "irresistible inference" that Chiang obtained the money by instructing 10 junior staffers to hold options on stocks in two companies on her behalf to avoid listing rules. "In all circumstances, she must have been the mastermind of the illegal scheme," he said. "She must have been fully aware of making such false representation in a scheme designed by her." Chiang hid from the Securities and Futures Commission that she was "the real beneficial owner" of the options and had induced the stock exchange to approve a prospectus of Eco-Tek Holdings which contained false information. As the former chairwoman of Pacific Challenge Holdings, Chiang's dishonest acts, committed in 2001-02, cost economic loss to her companies, shareholders and potential investors, he added. Co- defendants Tahir Hussain Shah, 45, and former Eco-Tek chief executive Pau Kwok-ping, 54, were also found guilty of fraud and conspiracy to defraud. Counsel will present mitigation submissions this morning. Sentencing is set for next week. Outside court, Chiang's sister Ann Chiang Lai-wan said: "She did not expect such a verdict. No clothing and skin- care products were prepared." The family will decide whether to appeal next week. Chiang's stepmother Ma Jwung-hwa said she is "heartbroken." Chiang is the fourth daughter of industrialist and philanthropist Chiang Chen, 87, who founded Chen Hsong Group, one of the world's largest injection-molding machine makers. Five of her seven siblings are national or provincial members of Chinese People's Political Consultative Conferences. A mother of four, Chiang became the first female head of the city's oldest business chamber in 2007. She is a member of Shandong provincial CPPCC. She had expressed an intention to run for the 2004 Legislative Council election and later became a member of the Liberal Party's executive committee. She was also named one of the Ten Outstanding Young Persons in Hong Kong in 1999 for her charity work. An older sister, Ann Chiang, vice chairs the Democratic Alliance for the Betterment and Progress of Hong Kong. Her third eldest sister, Agnes Chiang Lai-ping, was a popular singer and actress in the 1980s. Younger sister Chiang Lai-yuen is chief executive of Chen Hsong, helping her father since 2000. A judge yesterday said high-profile businesswoman Lily Chiang Lai-lei was a "dishonest and unreliable" witness. Judge Albert Wong Sung-hau told the District Court she tried to make up excuses to distance herself from the crime of which she is accused. The former chairwoman of the General Chamber of Commerce and her two co-defendants remained behind bars last night. They are awaiting their fate on a range of charges brought by the Independent Commission Against Corruption in connection with an alleged shares scam. Wong said yesterday he would finish handing down his verdict today. Chiang, 50, Tahir Hussain Shah, 45, and former chief executive of Eco-Tek Holdings, Pau Kwok-ping, 54, face charges including fraud, conspiracy to defraud, false statements by directors and authorising the issue of a prospectus that included an untrue statement. The judge's comments yesterday followed a dramatic move on Tuesday when he revoked Chiang's bail. Chiang - whose father is a prominent industrialist - is accused of pocketing more than HK$3.7 million by instructing others to hold options or shares in two listed companies on her behalf, contrary to listing rules. She allegedly kept the fact that she was the genuine owner of the shares and options from the Stock Exchange and the Securities and Futures Commission. Chiang wore a mask in court and from time to time bowed her head as she listened to the judge describe her as an unreliable witness. "She tried to distance herself from the scam," Wong said. "She tried to ... make up excuses for the granting of share options. I found that [Chiang] was not an honest witness," Wong said. "I refuse to accept the exculpatory part of her evidence." The judge came to his conclusion after saying he found it was unreasonable for Chiang to claim that she granted 8,844,800 Eco-Tek shares to her former personal assistant Iris Yip Yuk-chun as a gift, considering her minor role in the company. Yip, the prosecution's key witness - who is giving evidence against her former boss under immunity from prosecution - earlier told the court that she held the shares only on Chiang's behalf. Wong said: "Giving [Yip] such a large amount of shares is in my judgment out of proportion." Chiang earlier told the court that she was not involved in the selection of people who would receive share options at the time of the alleged crimes between 2001 and 2002, as she suffered from poor health and was seldom at the office. But Wong said that such a level of indifference on the part of Chiang - a majority shareholder in Pacific Challenge Holdings - was impossible. The judge also ruled that Shah was an evasive and dishonest witness. He said that he would be continuing his analysis of the witness' evidence. Chiang's sister, Ann Chiang Lai-wan, a vice-chairwoman of the Democratic Alliance for the Betterment and Progress of Hong Kong, said outside court yesterday that their industrialist father Chiang Chen did not attend the court because he had business commitments. She said they had told their father that his daughter's bail had been revoked. "You can imagine my father's feeling," Ann Chiang said. "He is a positive person. We, the whole family, will face the verdict calmly." She said: "What's most important is she knows we all support her." Lily Chiang Lai-lei, the former chairwoman of the General Chamber of Commerce facing fraud charges, will learn her fate either today or tomorrow after spending last night behind bars. Judge Albert Wong Sung-hau revoked her bail as he was part way through giving his verdict in the trial of Chiang and two co-accused. They had been on bail up until yesterday's proceedings in the District Court. "For reasons I will give, I've decided it is appropriate to revoke bail," Wong said. Local hip hop group LMF's leader, bassist and graphic designer Prodip Leung has a thing about little green men. The musician's debut solo exhibition, titled Tribe of Many Colours, features 25 paintings and drawings that showcase his wild imaginings of extraterrestrial life. The artist has long been interested in the subject and two years ago published a book, Project After Dark, featuring his alien art. His hip musician and designer friends packed the opening party last week at the Museum of Medical Sciences, where the show runs until June 19. While DJ K.I.T manned the decks, the party rocked and after a few vodka shots, guests might well have seen strange lights in the sky.